To make robots more cooperative and have them perform tasks in close proximity to humans, they must be softer and safer. 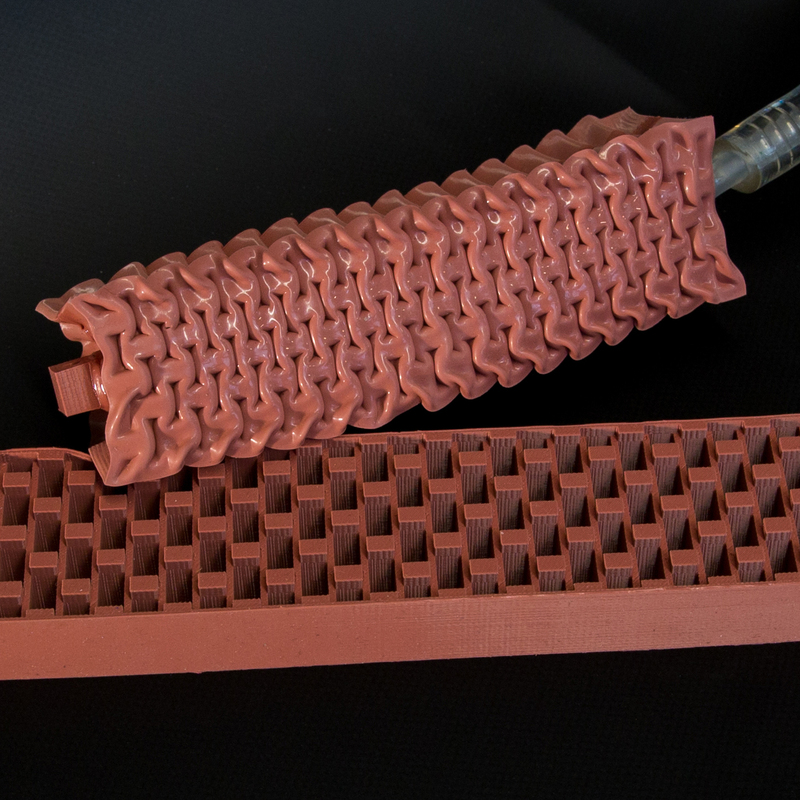 A new actuator developed by Harvard researchers generates movements similar to those of skeletal muscles using vacuum power to automate soft, rubber beams. Whitesides is also a Director of the Kavli Institute for Bionano Science and Technology at Harvard University. Whitesides’ team, which included Zhigang Suo, the Allen E. and Marilyn M. Puckett Professor of Mechanics and Materials at the Harvard John A. Paulson School of Engineering and Applied Sciences (SEAS), took an unconventional approach to its design, relying on vacuum to decrease the actuator’s volume and cause it to buckle. While conventional engineering would consider bucking to be a mechanical instability and a point of failure, in this case the team leveraged this instability to develop VAMPs (vacuum-actuated muscle-inspired pneumatic structures). Whereas previous soft actuators rely on pressurized systems that expand in volume, VAMPs mimic true muscle because they contract, which makes them an attractive candidate for use in confined spaces and for a variety of purposes. The actuator – comprising soft rubber or ‘elastomeric’ beams - is filled with small, hollow chambers of air like a honeycomb. By applying vacuum the chambers collapse and the entire actuator contracts, generating movement. The internal honeycomb structure can be custom tailored to enable linear, twisting, bending, or combinatorial motions. “Having VAMPs built of soft elastomers would make it much easier to automate a robot that could be used to help humans in the service industry,” said the study’s first author Dian Yang, who was a graduate researcher pursuing at SEAS during the time of the work. Although a complex control system has not yet been developed for VAMPs, this type of actuation is easy to control due to its simplicity: when vacuum is applied, VAMPs will contract. They could be used as part of a tethered or untethered system depending on environmental or performance needs. Additionally, VAMPs are designed to prevent failure – even when damaged with a 2mm hole, the team showed that VAMPs will still function. In the event that major damage is caused to the system, it fails safely. Harvard’s Office of Technology Development has filed patents on this and related inventions, and the soft actuator technology has been licensed to Soft Robotics, Inc., a startup launched in 2013 and cofounded by Whitesides. The company is developing robotic grasping systems toward initial applications including picking and packing in unstructured environments—for example, handling fruits and vegetables in produce distribution warehouses. Longer term, this technology can be leveraged to develop products for biomedical applications. In addition to Whitesides and Yang, other authors on the study included: Mohit S. Verma, Ju-Hee So, Bobak Mosadegh, Christoph Keplinger, Benjamin Lee, Fatemeh Khashai and Elton Lossner.